You’re sound asleep, dreaming. It’s a good dream. You’re young again, living up the summer after high school graduation. Your favorite song by [band that you secretly liked but always scoffed at around friends because, duh, you were too cool to listen to Avril Lavigne] is playing. But there’s a bright light hitting your eye lids, slowly pulling you to a state of consciousness. And suddenly, you’re awake. You scramble out of bed. What time is it? Why didn’t your alarm go off? Why isn’t your annoying cat licking your feet until you feed her? And then you look around. Your surroundings are familiar, but not what they should be. You lift your head and look into the full-length mirror on the back of your bedroom door. You’re younger, perhaps skinnier, less wrinkled, and more pimply. You see a cap and gown draped over your desk chair. And then you know: you’re 18 again and you just graduated from high school. All right. So you’re 18. You’re 18! But not really. You’re actually 25, or 30, … 45, 50, 65. But you’re back in your 18-year-old body. So now what? Here’s your big chance at a do-over. Would you go straight to college? Would you study something different? Would you take out student loans? Would you muster up the courage to ask that one guy/girl out? How would you handle life differently, or would you change nothing? Well, I’d be about 1000x less naive as far as money is concerned. I’d get a real job the summer before college, not a job babysitting my neighbor’s kids and making roughly $4/hour — it was easy, and I wasn’t ambitious. I’d go to the same university, keep the same major and minor, but work harder at getting good grades. I started with a scholarship and lost it after my first year. I’d still probably need to take out loans, but I’d be more aware of my spending. And hopefully my half-tuition scholarship would become a full scholarship after ending my freshman year with a 4.0 GPA. As far as my life choices, I don’t think there’d be any boys turning my head since I’d know about a very particular guy I’d meet my sophomore year. Oh, and I’d invest in an up-and-reviving stock that went by AAPL. The first thing I’d do is start listening to all of today’s more popular indie bands as they’re just starting out. That way I could tell everyone I know about how I was listening to Bon Iver or Arcade Fire or whoever before they were cool. Because who doesn’t like that guy?… Kidding. Like Joanna, I’d go to the same school, but I think I’d choose a Business or Finance major. Not because I don’t enjoy my current career, but because my current career requires absolutely no education as it’s based entirely on the contents of a portfolio. I wouldn’t quit my job at Jamba Juice halfway through winter semester because waking up BY NOON (!) wouldn’t be as difficult anymore. I would take none of my college shenanigans/pranks back EXCEPT for the time I inadvertently flooded the entire 2100 wing of our dorm and made the soggy carpets smell like rotting goat’s milk the rest of the semester. Sorry dudes. If you decided to make different choices, is there anything you can do about those choices now? What’s holding you back from changing your career, getting more schooling, etc.? 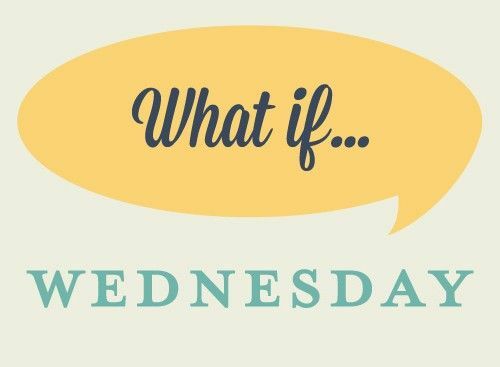 What If Wednesday: You Won the Lottery. Now What? Good question.. In some ways I´d love to be 18 again, and do it all over again, just this time don`t get a chronic ilness and lose 3 years of my education. I´d probably head straight to the University where I´m at now, instead of that horrible college, or that other stuck up university. That’s rough. But by the sounds of things, you’ve made the most of the bumps in the road. It’s hard to see the mistakes/misfortunes, but what would we have learned without ’em? What a question! I was 17 and incredibly naive when I started college but I wouldn’t really change anything-because I’m pretty darn happy where I am and learned a lot of valuable lessons. But off-the-record, I would go to a school with warm weather year round. I would play volleyball. I would major in something that I loved but didn’t think I could make a career out of-sociology. And I would go to more of the free speakers and events on campus. And since I’d probably need all the financial help I could get, I would probably pull from my future stock knowledge as well. That’s a really good one! I wish I had taken advantage of more of the resources that were available to students. I don’t know anything where people are so willing to spend/borrow tens, sometimes hundreds, of thousands of dollars, and then proceed to dread and actually avoid said product. I wish I had thought about ROI a little more instead of settling for the bare minimum. Oh, the list is WAY too long. About the only things I’d leave the same are Rick and my beautiful kiddos. And that’s probably the only thing that really matters anyway. Good answer. Nice mentioning of the butterfly effect. I go back and forth on what I’d change but if I did I don’t think I’d want to risk the way things are today. That concern wouldn’t even dawn on me. And I’d likely to start WW III due to my ignorance. Should time traveling machines come around, it’d probably be best to keep me away. There are definitely some things that I would change! Number 1 – spending more time with my dad! Great answer. There are a number of people in my life I wish I had taken the time to be with. But all of those missed opportunities have made me more cognizant of how I spend time with Joanna and now, Baby Girl. I don’t really like to think about the alternative lives that I could have lived, because I love how things ended up, even if I made a lot of mistakes over the years to get where I am. Without making mistakes, I wouldn’t be as savvy or frugal as I am now. Johnny, you look like Justin Timberlake when he was going through his perm phase haha. I absolutely love Arcade Fire. And Bon Iver. Two of my faves. Moneyseed, great point! I don’t usually dwell on what could have been either, but this was a fun exercise for me in accessing what I do know now! BTW, I thought Justin Timberlake too! Hilarious! Justin Timberlake would be lucky to lay claim to those locks. What’s really weird is my hair lost its curl over the last three or four years. Those pictures make me miss the days of not having to cut my hair for 6-8 months. If I was 18 again, I’d invent Facebook. I would probably invest more time designing my MySpace profile with animated gifs. What a great post and something that I talk about with my students (I work at a small college) all the time! I definitely wouldn’t be naive about money and student loans – you have to pay those suckers back! I would have gotten a job sooner in college and maybe chosen a major that would lead to a more secure, financially stable job market. But alas, hindsight is 20/20, and I’m happy where I am today. Joanna and I were so naive and clueless about school costs! I don’t put all the blame on ourselves for that lack of understanding, but it’s something we probably should have looked into a little closer. I really wish I could go back in time and stop myself from going to a for-profit school. How great it would be to not have six figure debt! I would probably hold off on college for a few years, work and save up some money. Then I’d go to college, definitely a different major and try to pay my way through. I would probably still end up with student loans but not much and I’d be smart about paying the interest while I was in school. What a dream! But had all of that panned out so beautifully, you probably wouldn’t be able to warn and help future students like you do over on your blog. Your post today was great. Thanks Johnny! And true that! Also, I probably wouldn’t have met my husband or some of my college besties! If I am 18 again, I would write my thoughts down more often by creating my own blog. I started blogging less than five years ago. Can you imagine how many stories and thoughts I can capture between that time frame? Also, I would set aside a portion of my allowance so that I can invest. Even though I learned these things later in life, I have no regrets because I know that I am still young and I can still do a lot for my future. By the way, great question. That’s the right attitude! There’s still plenty of life to live. But I sure wish I had started writing regularly a lot younger. I’m sure a lot of those entries would seem especially juvenile, but no doubt I would have grown as a writer a lot faster than I have. You’re right. I guess if I started out earlier, maybe I’ll laugh at my old writings because they were so juvenile. If there was anyway to be less naive about life – I’d change that. I’d probably spend a little less time goofing off and more time being ambitious. Oh, and I would’ve joined a band and rode the grunge wave (I was 18 back in ’95). My freshman year was a disaster, but luckily I wised up the rest of college. Probably my biggest regret freshman year was listening to the limited emo music I threw on my mix CD’s back then. That music was/is garbage. The obvious answer for me would be to choose a better husband so that I would still have a husband and not be struggling with my finances in my late 40s but I wouldn’t want that because I have amazing sons and changing any of those years in my life might change them. It sounds like you’ve got the right perspective. Life’s mistakes and mishaps are never fun, but we usually stand the most to gain from those moments. Thanks for your comment. I am pretty self-motivated and would have liked to see if I could have ended up in the same career without going to college through networking and apprenticeship/internship opportunities. Making $ and learning at the same time…novel idea… I think our university systems leave a lot to be desired, especially in the cost arena. Mayhaps exploring alternatives to higher ed is a good idea? With enough cash saved up, I’d wait until my mid-life crisis to reassess my life and go to school at that point…and buy a red sports car…and plan my retirement in Boca. I’d be alright with the sports car and Boca retirement if I HAD to. I agree with your do-over thought. I’d be interested to see what might have happened without higher education. Well. I would have to tweak this scenario a bit because I was 16 when I graduated from high school and turned 17 the next month. 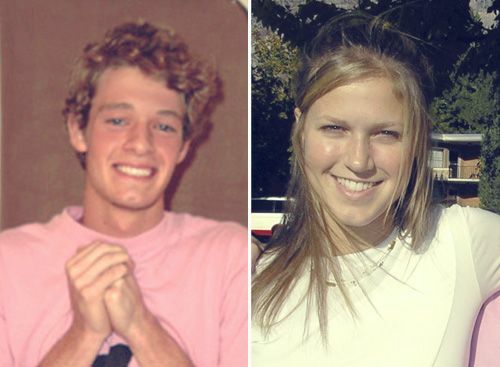 It would be really difficult for me to say that I would go to a different college because I went to the school that my boyfriend (and now husband) went to. It wasn’t my first choice but I got to be with him so it was worth it to me. I probably would have majored in Business Admin from the beginning. I also wouldn’t have tried to take such a full course load my freshman year. I burned out really quickly. If I had it to do again I would have taken more of the basic courses online. I’m better at working at my own pace. I only ever took out one small student loan and honestly I probably could have avoided that by getting a better part time job. I worked the front desk at my dorm and my paychecks were maybe $100 and were immediately spend on food and gas and other junk. I would have applied myself more with school and tried to be more social and make friends. I have hermit tendencies. I wouldn’t have pigged out at the cafeteria so much (and gained the Freshman Fifteen). Where I got into real money trouble was the summer after my freshman year (when I actually turned 18) because I was able to apply for credit cards then. I think you know where this story goes… Live and learn. Woah! You were a youngin’! Those are all smart takes on do-overs. I’m usually all for deregulation and letting able bodied people make decisions for themselves, but credit card companies shouldn’t be allowed to market to anyone under the age of 21. Especially if they’ve got little to no income because they’re a student. Seems pretty shady. I wouldn’t change too much because I’m thrilled with where I am. I wish I would have studied a bit more for calculus, had to take that twice, which was so yuck. Wish I had gotten to know some of my professors better, sooner. My senior year I developed a great working relationship with one of my professors and looking back I could see all the professors in my major (small department) had such varied knowledge and different perspectives from their careers. Definately wish I didn’t take that road trip where I hit a deer and totaled my car, although even that was an incredible learning lesson. Financially, I think I did what I could. By the sounds of it, I bet that deer wishes you hadn’t taken that road trip either. But good for you for being happy with your choices. It’s always great to hear the word “thrilled” when one is explaining how they feel about their life. Such an interesting post! I honestly haven’t thought back to my 18th year for awhile, even though I’m only in my mid-twenties today. So what would I have done differently? I already had 2 years of (free) college done by the time I transferred to a university at 18, but it took me 1 year to figure out a major and 2 more to finish out my degree, making that a total of 5 years in college (2 at cc, 3 at uni). If I could change anything, I would change the time spent at university because that is where my students loans accumulated. That first year was a mess of me trying to choose my path but if I realized that, for the most part, a degree does not equal a career, that would have helped in choosing a major and keeping my time at the university down to 2 years. I used to go shopping during three-hour breaks in between classes. I feel so ashamed to say that now! Haha. Don’t feel ashamed. I used to stay up all night with my friends until the cafeteria opened for breakfast at 6am. And while the smart, ambitious students would be trickling in for their meals before classes, we’d be wrapping up the day with a plate of bacon before hitting the sack. Now that’s shameful! I definitely agree with wanting to make more of the time I spent at college. Given the amount we spent there, we probably could have gotten a better ROI. Just found your blog yesterday and I’m obsessed!! If I were 18 again, I’d start college not worrying about impressing people and figure out ME first rather than who I wanted to be for other people. I spent a lot of time in college just trying to fit in and didn’t really find my niche until senior year. Small website question: It has been a little bothersome to have to scroll to the bottom of the page past the comments to see the next and previous page links. Any way to put them at the bottom of the blog post? Sorry if this is out of line! Thanks for stopping by Kaylyn! I definitely wish I had spent more time figuring out who I was and what I wanted out of life then. I’d have made better a few better decisions with that mindset. Ask and you shall receive! I added the nav right after the post and left the other one at the bottom of the comments. Thanks for the tip. You’re awesome! I’m impressed that you are answering every comment, I love it when bloggers are interactive. Honestly, I wouldn’t change much. I chose good schools, good subjects, good friends and boyfriends. I would go back and make time for applying for summer internships and research positions during the school year even though I felt I didn’t have time for it. Getting those extra jobs and experiences probably wouldn’t change my career track or the schools I got into, but maybe I would have gotten a fellowship (more $) and had better career prospects. In general, my only regrets are things I didn’t do! Regrets of omission. Much better than the alternative for sure. I probably could have done more with seeking real-world experience earlier. By the time I got my first job in my career field, I literally still had no idea what my career would be like. It probably shouldn’t have come as such a surprise. When I was 18 I pretty much did what was expected of me education wise. I really had no clear idea what I “wanted to be when I grew up” so it was just easier to do what got my parents off my back. That meant going to university, because that’s where bright students ought to go, don’t you know. Didn’t seem to matter to anyone that I wasn’t interested in anything they offered, so I picked the least unappealing program and graduated with the least effort possible. My parents paid my way for the first 2 years and then I got married and paid for the last year with part-time jobs and my husband’s entry level job income. In hindsight I should have been looking at college programs not university, and then I probably would have found a program I could have gotten enthused about, but my parents not only didn’t encourage that, they actively discouraged college in favor of university. I was never interested being an architect, engineer, journalist, psychiatrist etc etc. I should have been looking at something like graphic design, drafting, interior design, or something creative/artistic (it wasn’t available 30yrs ago, but now I’d be looking at multimedia design, animation, web design etc). But as the child of two elementary/highschool teachers, I assumed they were right when they implied college was really more like trade school, and I belonged at university. What total nonsense. In most other ways I wouldn’t change a thing. I married very young but as we approach our 29th anniversary, clearly that choice worked out. I would do things differently with regard to our finances though. We’ve never spent wildly, but we weren’t frugal until until we hit our 40s and a layoff caused us to totally reevaluate how we were spending our money, and how much we were wasting. We’re on a good path now and planning to retire early, but if we’d smartened up and been more frugal in our 20s and 30s we could have retire in our 40s rather than our 50s. As a result of my misdirected, badly chosen university education, I’ve consciously encouraged our kids to study what interests them. Yes it would be nice to make a big income, but frankly loving what you do is far more important. Hopefully they can make a good living doing what they love, but given a choice I’d rather they be happy than rich. Joanna and I also married really young, so I’m glad to hear your success story. I also think you bring up a really good point that is still missing in today’s higher education selection process. Most kids/parents choose a school, not a program. Instead of choosing the school with the best program, we buy into a school’s “brand.” It’s totally backward. And I love your final point about loving what you do and not the money that it generates. I agree wholeheartedly. I would have started investing a lot earlier. I would also would have gotten my diet and exercise under control back then too. I would have done a bunch of other things differently as well. But as they say, hindsight is 20/20. When we took out our student loans, we had to take a one-hour class provided by the school on debt and loans. I remember the counselor talking to us about starting a Roth IRA that year and the benefits of compounding interest. His message stuck with me… but I never took his advice, unfortunately. Current me and future me regrets that one. I went to a great school but I had no guidance or direction. I wish I had an idea about saving for the future and I wish I’d never touched that 1st credit card. But, who knows-I like the person that I am now and all of those choices made me the Michelle that I am today. I do think I should have started a regular job sooner. But, I loved working part-time being a dancer and auditioning for things. I guess I wouldn’t change much. Now-Michelle is just dandy so you’ve done just fine. But looking back, I think our schools, parents, etc. probably could have done a better job preparing us for the important financial decisions and implications that lay ahead. Sure would have been more useful than that Physics class I nearly failed. Whoops, sorry I didn’t answer your question! You know what’s up! I’ve still got most of the smoothies memorized. Citrus Squeeze is my go-to. But I was freaking hooked on the seasonal Pumpkin Smash. Maybe the next time we’re near Chapel Hill, we’ll stop by. I’ll pour some out for you. 18 was pretty good! I don’t think I’d change anything. Or, maybe I’d go back and tell myself to work less and start snowboarding, but that is certainly different than giving myself financial advice like you suggested. I was working a lot, going to school a lot, and volunteering a lot. I was having fun too, but I was definitely taking life pretty seriously…maybe a little too seriously! Hah. I probably could have afforded to live a little more like you and you a little more like me. It all worked out though, so no complaints. I’d probably try to just enjoy things a bit more, knowing that all those little things won’t really matter in the long run. Maybe not spend so much of my ‘extra money’ and have saved it for a bigger down payment on my home. Ultimately, I wouldn’t want to change to much though because my past is what has made me who I am today. A few small changes like that probably wouldn’t send the universe in too much disarray. But I agree on not changing much of my life’s choices, warts and all. I would’ve worked less! Also, I would’ve dumped the miserable girl I was dating my first semester, so that I could concentrate on school and not lose my full tuition scholarship my first semester :). And by doing that I would’ve worked less because I wouldn’t have had to pay for school out of pocket! Butterfly effect for sure. Seriously… one little thing can change so many things. If I’d been able to keep my scholarship, Johnny and I might have left college with no debt as a couple. But then we’d probably not be writing about PF right now! I would take a few years off after high school to work, travel, and figure out who I was and what I really liked to do. Instead, I went right to school and had no clue what I wanted to be so ended up with a degree in a field that I didn’t even want to work in. I would also go to a much smaller school. I went to a Big Ten university and I’m not a joiner so I pretty much got lost in the masses and I didn’t have relationships with any of my professors. That said, my bad choices regarding college have allowed me to help my children make better choices, which makes me happy. My oldest is a lot like me and I talked to her a lot about finding a school that fit her personality and picking a major that will allow her to get a job she likes. She loves her school, loves what she’s studying, and has relationships with many of her professors (and she just got to celebrate her school winning a national championship in basketball; how cool is that?). It’s funny how the things we would change about the past are oftentimes the things that have made us wiser in our lives. Your daughter is lucky to have you helping her to make better schooling and career choices! There’s so much I want to help our little girl with as she gets older, like being more aware about managing money for instance. But if it hadn’t been something I struggled with myself, I probably would realize the value of teaching it to her. Crazy how that works! I wouldn’t change my major but I would have gone to community college for the first two years and than transferred to a state school instead of going to that very lovely private school and the having to transfer anyway. I would have ended up with a lot less student debt and THE EXACT SAME DEGREE. If there’s one message that needs to get out to high school juniors and seniors, it’s this one. Focus more on the degree you’re seeking, not the name of the school. If I had my brains now I would go for the same type of education, business administration. I would probably still be with the same company, but would have a massive head start on the job skills-wise. I would skip living in the dorms (I already have that experience) and live at home while driving a short 30 minutes to get to class each day. I would work the same college job I had (15 hours a week in maintenance) and do generally the same activities. I would get through college with no debt, great job opportunities, and awesome memories. I don’t think I would miss living in the dorms. I was more of a shut-in anyways and it would have been nice to spend more time at home. I’m a lot more practical now. Skip the dorms?! You’re crazy. But it sure would have saved me a lot of money AND improved my grades. But it sounds like you’ve made some good decisions along the road to be in a spot where you wouldn’t change the outcome.